Results are in for Student Senate elections for 2019-2020 academic year. All positions have been elected by students of Madison College and still need to be accepted by senators to make everything final. Approximately 2.7 percent of the student population voted in this year’s election, which is around the average for a community or technical colleges. All senators elected are from the Madison area except for Breanna Zabel who is representing the Watertown Campus. The following students ere elected to serve on the Student Senate in 2019-20: Spencer Allen, Wilso Annulysse, Henry Beasley, Itziar Flores Ramirez, Braedon Gibson, Keyiona Johnson, Cat Mellender, Jade Meyers, Thomas Stokes, Alec Tebon, Jake Timmerman, Katrina Willis, Breanna Zabel (Watertown Campus), and Eric Ziebell. Jonathan Jones will be the Student Senate President for 2019-20. With the election results in the transition to the new senate starts. The transition will begin with getting new senators acclimated to the senate. They will be required to attend general assembly meetings to see how the senate operates. On April 18 a training will held for all senators, both incoming and returning. Once all positions are accepted, senators can be nominated or nominate themselves for Vice President positions. Swearing in of the senators will happen on May 9 the last Thursday of the semester, after that the senate for the 2019-2020 year will be officially in place. The senate will continue to meet every other week over the summer. Jonathan Jones was the Vice President for Public Relations this year and the only candidate running for Student Senate President. With Steven Ansorge as the outgoing president at the end of the semester it will be up to Jones to lead the transition. Sharing his plans for the 2019-2020-year, Jones talked about connecting to the regional campuses. 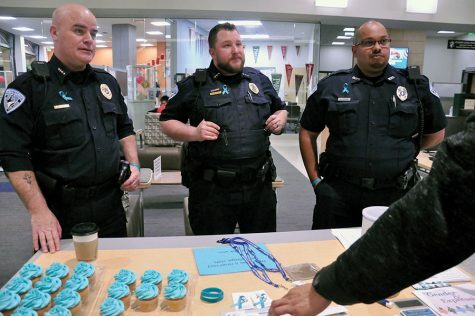 “Historically speaking campuses outside of Truax have felt out of the loop and disjointed I’d like to see that ended,” said Jones. Jones also spoke about building up relationships with community resources. “I’d like to establish stronger ties with communal resources/companies, such as libraries, community centers, food pantries, etc. to build a stronger student experience for those attending Madison College,” said Jones. In transition Jones will be working closely with Ansorge to learn the role Student Senate President. “He (Ansorge) has helped me understand how a President is supposed to interact with other groups/organizations as well as how to delegate and organize tasks to accomplish goals,” said Jones. Going forward Jones knows it won’t be easy, but he is ready for the challenge. While the Senate is set for the 2019-2020 year, there are still some senate positions open in case any incoming students in the fall want to join. All students have to do is attend three general assembly meetings and fill out the application to become a senator.